VDC – Vandelta Communication Systems Ltd. provides service and sales of Intercom, Access Control, CCTV, Video Monitoring, Key Fobs, Tags, Key Cards, Security Bars, Intercom Covers, Rainhoods, Locksmithing and Electrical for thousands of satisfied customers throughout Greater Vancouver, the Lower Mainland and the Fraser Valley. Retrofitting enterphones and intercoms daily since 1971. Enterphone, Mircom, Aiphone, Linear, DoorGuard, SES, Sentex, DKS Doorking and many more. Integrated access control systems: elevator floor to floor control, intercom integration, reports and cloud based management. Keyscan, Kantech, CDVI, ICT, Mircom, SecuraKey and many more. Securing Vancouver and the lower Mainland 24/7. Affordable and reliable IP and analog solutions. HIK Vision, Geo Vision, Bosch, FLIR (Digimerge), Pelco, Panasonic, Digital Watchdog and many more. 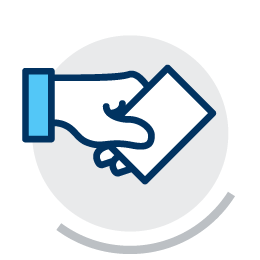 Helping provide customers with an enhanced level of security while minimizing business risk and reducing costs. VDC - VANDELTA carries 25 different varieties of fobs IN STOCK at all times. Let our knowledgeable administrative staff know your requirements. Your new key fobs will be shipped to you that day! VDC Vandelta suggests installation of a security bar and lock to prevent vandalism and break-ins through the intercom system. If you are locked out or need a new lock fitted urgently or your electric door strike is buzzing continuously open – call now for IMMEDIATE DESPATCH from VDC Vandelta. VDC – VANDELTA have ticketed certified electricians on staff. We have prewired 1000s of construction and retro-fits. We can scale our crew accordingly quickly to meet your time and budgetary requirements. 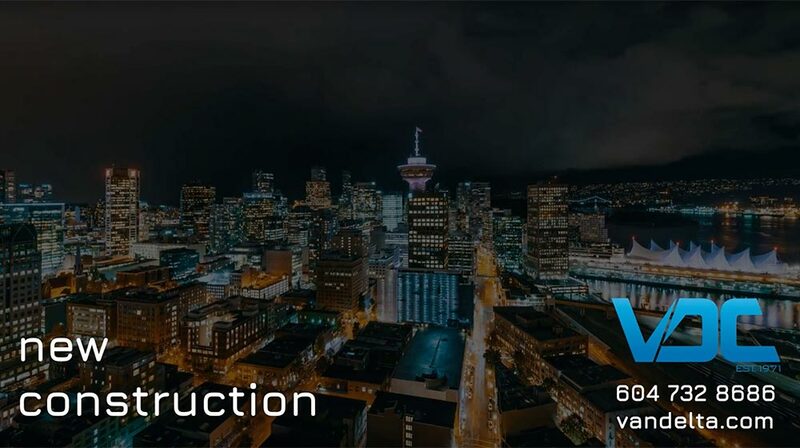 VDC VANDELTA has installed and serviced over 15,000+ intercoms for Property Management and Multi-Residential Strata, Apartment Owners, Construction Contractors, Government and Businesses throughout Vancouver and the lower mainland. 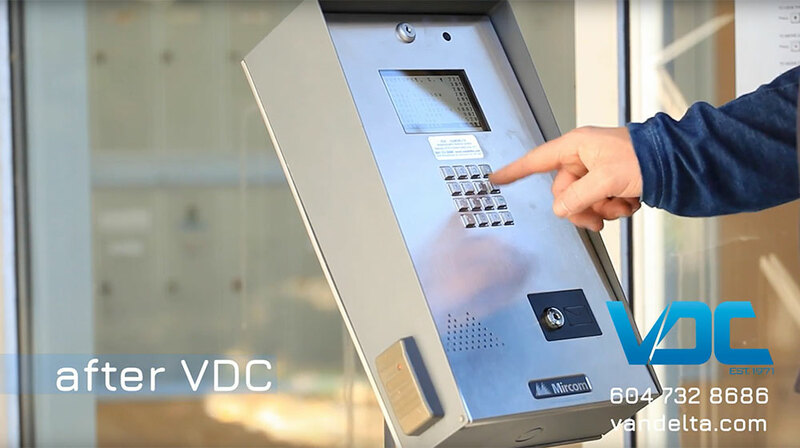 VDC-VANDELTA is “the” leader in Intercom & enterphone telephone entry system new and retrofit installations. We are authorized dealers for Enterphone, Aiphone, DoorGuard, Mircom, DKS DoorKing, Linear, Kantech, Camden, SES, Sentex, Viking and many others. 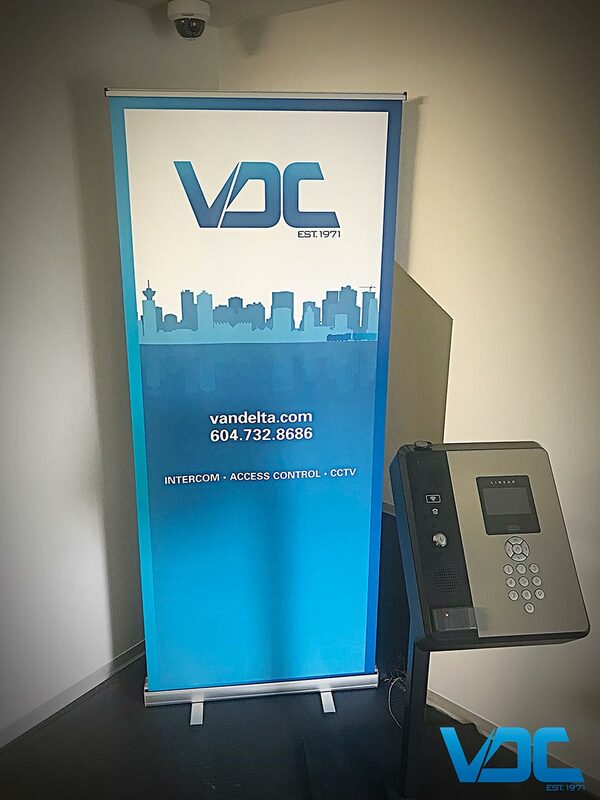 VDC VANDELTA has installed and serviced over 5000+ access control key fob systems for Property Management and Multi-Residential Strata, Apartment Owners, Construction Contractors, Government and Businesses throughout Vancouver and the lower mainland. VDC-VANDELTA is a leader in Vancouver Security & Access Control. We are authorized dealers for Keyscan, Kantech, RBH Technologies, SecuraKey, ICT InAxsys, Honeywell, RCI Rutherford Controls, CDVI & Viscount Freedom. 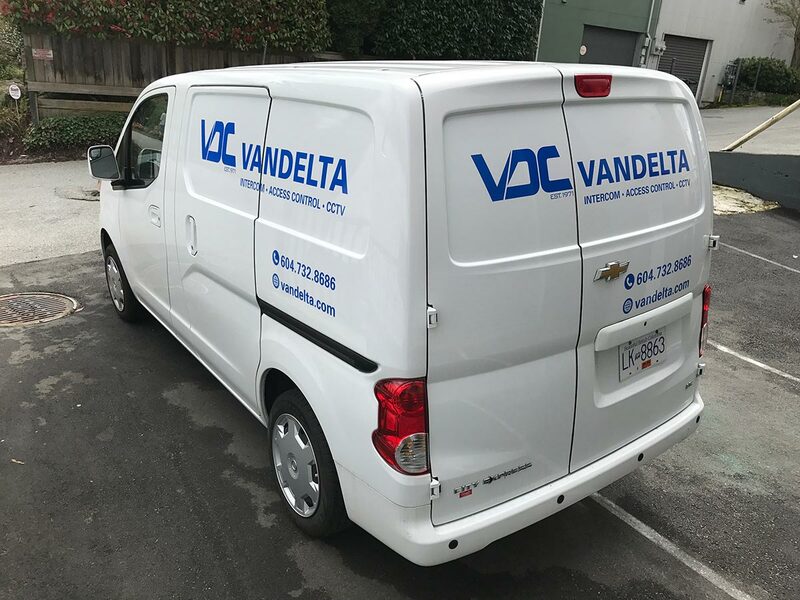 VDC VANDELTA has installed and serviced over 5000+ IP and analog cctv & video surveillance systems for Property Management and Multi-Residential Strata, Apartment Owners, Construction Contractors, Government and Business throughout Vancouver and the lower mainland. VDC-VANDELTA is a leader in Closed Circuit Television (CCTV) and Digital Hi Definition IP cameras, Digital Video Recorders (DVR & NVR). We are authorized dealers for Bosch, Digimerge, Pelco, GEO Vision, HIK Vision, Ever Focus and more. VDC – Vandelta Communication Systems Ltd. provides service and sales of Intercom, Access Control, CCTV, Video Monitoring, Key Fobs, Tags, Key Cards, Security Bars, Intercom Covers, Rainhoods, Locksmithing and Electrical for thousands of satisfied customers throughout Greater Vancouver, the Lower Mainland and the Fraser Valley. We go the extra mile to ensure only the highest quality products are offered to our trusting clients. VDC Vandelta retrofits the older Enterphone and conventional wired intercoms several times a week. We are the retrofitting and new installation intercom company in Vancouver and the lower mainland. Since our inception in 1971 we have installed and serviced over 15,000+ intercoms & enterphone (s), 5000+ access control / fob systems & 5000+ CCTV video surveillance systems in Vancouver and the lower mainland. We have in our inventory, hundreds of obsolete and new parts to maintain your properties, helping to keep your service costs within budget. In addition to our commitment to service, we have expanded our new product line. We are factory-authorized dealers for numerous manufacturers of intercom, CCTV and access control fob systems. 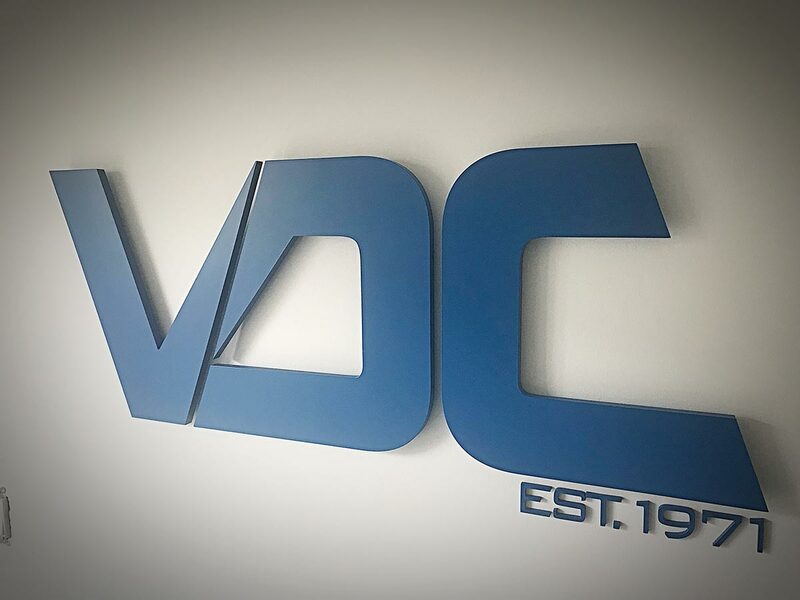 Together with strategic manufacturing partnerships, VDC is able to meet your budget concerns without compromising the aesthetic requirements of your properties. Our website is designed specifically for busy Property Managers requiring immediate product information and material for strata meetings. VDC maintains an Advanced Gold level rating with Worksafe B.C, an A+ report with the Better Business Bureau, membership in good standing with the Landlord BC and extensive liability insurance coverage. 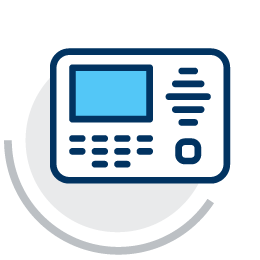 With our increasing client base, VDC continues to provide complete and reliable intercom, CCTV and access control installations and service to communities in the lower mainland, Fraser Valley, Vancouver Island and the North Coast. Our service rates and system quotes are competitive. We offer 24-hour emergency service 7 days a week. Arrangements may also be made for on-site product seminars. For the very best in Vancouver security systems, contact VDC Vandelta. Custom Fabrication and Brilliant Results! DON’T be fooled by contractors with flashy websites, big promises and low pricing. These integration companies tend to under deliver, rush installations and cut corners. Often property managers call us to repair careless installations by competing companies. If price is the main determinate let us know and we will work out a favorable pricing strategy. Communication, customer care and transparency have always been the main ingredients to our service and installation success. We have outstanding relationships with every property management company in BC. This includes numerous developers, construction companies, property owners and restorations companies. 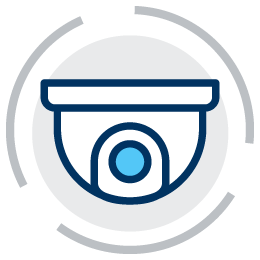 Visit our 3000 square foot office in Vancouver and get to know your security professional. We are fully staffed with a fully stocked warehouse! Every item listed on our website is available for purchase and in stock at all times in our Vancouver office. Call us today for an in office or on site demonstration. Would you like to speak to one of our actual customers? We have 100s of clients that gladly would provide a written or verbal reference should you wish.